A friend invited to me go kayaking up at Cachuma Lake yesterday. I hesitated at first. It’s been quite awhile since I’ve been out on the lake. In fact, I’ve actually avoided going. The drought in California has impacted the lake on such a level, that it’s depressing. Getting out in nature should never have that effect. I decided to go anyway. I met my friend at his campground, and we headed to the lake. It was worse that I could have ever imagined. The lake was a mere fragment of it’s former self. Wow! I felt as if I had been punched in the belly. I stood staring in disbelief. I wondered how much longer before it totally disappeared. A pipe running through the center of Cachuma Lake was pointed out to us. It’s impossible to miss! The pipe feeds water down into Santa Barbara. This July, there are plans to drop the lake ten more feet to keep that supply running. What happens when Cachuma Lake ceases to exist? Where will you get your water from Santa Barbara? To see the lake disappearing, you face the reality of how important it is not to lift the water restrictions too soon. And, it makes you wonder why nothing was done sooner. Once in the water, you can’t help but notice the beauty surrounding the lake. As we paddled around the lake, we talked about what a great loss this would be for all of us if a solution isn’t found. Rain, of course would be the most obvious solution. That, however cannot be relied on. So, until Mother Nature starts producing it again, what are our options? Ready, Set, Go! Ireland Bound! Ready, Set, Go…. It should have been that easy right? I knew I was going to return to Ireland before I had even returned from my last trip there. I was in love with the country, and knew I’d be back for more… Love is like that after all. Who doesn’t want more of a good thing? It was just a matter of figuring out the details… Where would I stay? How would I finance this adventure? How long would I be able to do this for? This trip was also somewhat of a test for myself. Could I give up having an actual home, and start my dream of living the gypsy life? I’ve been thinking about it for awhile, and was more than ready to go. I had originally planned on throwing some stuff in storage, selling what I no longer needed, and just using airbnb as living quarters along the way. This, however, freaked out some of my friends and family that weren’t quite as enthusiastic about my plan as I was. They thought I might regret giving up my apartment in Santa Barbara… It is a pretty sweet place, and in the perfect location! I think their actual motives were that, they would have to find a new place to stay while vacationing in Santa Barbara… Kidding aside, I considered other options. I decided to sublet my place for the next two months. I thought that was the safer option, just in the event my gypsy life didn’t work out. So, I found a 70 year old man that wanted to test the waters of retiring in Santa Barbara, and sublet it to him. He seemed like a safe bet. I put my personal belongings in storage, and crossed my fingers that all was going to work out. I secured my first six days lodging in Galway, Ireland through airbnb, and booked a few days at a surf lodge in Bundoran, Ireland. I decided to wing the rest of the trip, seeing where the Universe would take me. I had worked enough the previous months, and was good to go with the financing… Or so I thought! My car decided it needed some TLC days before I was ready to leave… My travel budget took a $600 hit. Ouch! Next, there was the call from my bank. My business checking account had been hit with fraudulent charges. Someone in China had managed to make a physical copy of my credit card, and go on a shopping spree. The first charge was for $800 worth of awnings! Really? Wow! Eight more charges followed… How was this not caught immediately? It was time to sell something that would save the budget. I had a piece of gold jewelry sitting stored in a closet that would do the job… Trip saved! I’ve been flying standby for the past year, so I’ve got used to getting bumped to the next flight. I’ve spent more time in some airports than I ever thought I would, which can be mentally challenging after awhile. I’ve never flown standby internationally, and was hoping for the best. The night before I was ready to leave, I had to scramble to rearrange my flights. My original plan was hopeless. All the flights out of Los Angeles were so oversold that I would never make it onto any of them. My only hope was to fly out of Santa Barbara, which added one more flight into the mix. I had no choice… My sub-letter was moving in the next day, and I would be homeless. What’s one more flight anyway? Shockingly, I made all three of my standby flights! Put this one down the record books! I took it as a good sign that the rest of the trip would go well! After a lot of thought, I have decided to travel on my first ever Solo Journey! I’m so excited! I will be traveling for 5 weeks around Ireland with my backpack, camera in hand, photographing and blogging my adventures along the way. I’m also checking into opportunities to volunteer on Organic Farms through WWOOF. If you would like to be a sponsor, or can spread the word through social media, check out the details here. Did I dream it or did it dream me? If you’re in Santa Barbara on the Second Saturday of the month, make sure to find your way to the Funk Zone. Every month over 20 artists open their studios and galleries to the public from 1-5 pm. Many venues in the Funk Zone feature live music, and there are plenty of wineries to check out too! Start early if you want to see them all! My first stop was The Arts Fund Gallery. They featured multiple artists inside, as well as outside. They also had live music, a food truck and free tastings from Jun Brewery. This is not beer my friends! It is a craft fermented probiotic drink. It’s brewed with Raw Organic Honey and Jasmine. It does have a light alcohol content, so if you’re a lightweight, watch out… Kidding! Joking aside, it was a tasty alternative drink, and quite refreshing on a hot day. And, I’m pretty sure it’s good for you too! You can schedule a tasting by going on their website. Next I stopped was over to check out the art of Stafford Taylor. I absolutely love his art and will provide a link to his website soon. Santa Barbara Art Foundry & Gallery was next on the list. This place is super cool. It is an actual working bronze foundry, which you are able to tour. The art is an eclectic mix. You can find metal and glass sculptures, paintings, photography, and more. Don’t forget to stop by the wine bar to try some local Fox Wine! As I was walking to the next studio, I came across a truck parked on Yanonali Street & Santa Barbara St. At first, I thought it was some sort of food truck. I decided to investigate, and was surprised to find handcrafted treasures from local artisans and designers inside. How fabulous… Mobile Art! You can find The Habitat Factory in the Funk Zone on 2nd Saturdays or check out their website for more info. I should have started earlier! I was running out of time, and hadn’t even been to half of the studios! I managed to squeeze one more in before it all ended. I was drawn in by a pair of cowboy boots that had been converted to roller skates. There they sat promising more of the unexpected inside. In I walked to find the sculpture and assemblage art of Dan Levin. He refers to his art as Objects Of Curiosity, and that they are! Finished pieces coexist among a fascinating array of random objects. Last but not least, I headed over to Seven. A girl’s got to eat… and ok have a beer too! They also are a part of 2nd Saturday, so I figured I could see some art as well. The Pulled Pork Sliders, Parmesan Truffle Fries and a beer were the perfect way to end the Art Walk! I discovered the Grand Central Market, while hunting for parking in the Los Angeles Jewelry District. Driving by, I wondered why I had never heard about this hidden gem in downtown LA. It just cried out “Park your car and come on in”! So, after shopping, I did just that. I wandered over to Broadway to check it out. This is a market that got it right! It has a history dating back to 1917 and has been operating since then… Once again, how did I not know of it’s existence? It encompasses 30,000 square feet, and is filled with a crazy amount of food choices. I circled three times before deciding what I wanted! It has a little bit of everything… Multiple restaurants, fresh produce, bulk grains, desserts, fresh juice, coffee, and even a liquor selection. You can find moles, dried beans, rice, and specialty products at Chiles Secos or try Valeria’s for an extensive selection of Latin dry goods. Fresh seasonal produce and vegetable are available at La Casa Verde, Sun’s, or Torres Produce. The restaurant choices are diverse… Kababs, Chinese, Hawaiian BBQ, Oysters, Salvadorean and more! The prices are ridiculous… As in really good! I had such a hard time choosing! The debate was between Bento Ya Japanese Cuisine, Kabab & More, or Sarita’s Pupuseria. I ended up going with Bento Ya Japanese Cuisine. It was hard to pass up Grilled Teriyaki Chicken for just $5.75! It was a decent amount of food for the price, and tasted good too! I guess I will have to find a few more reasons to hit downtown LA. How else am I going to be able to try all the other options that I could only gaze at? I try to check out most of the 1st Thursday’s in Santa Barbara. We are lucky to have so many venues participate and support local artists. This past Thursday was the last After Hours event of the season… Why this does not run year round is a mystery to me. The Granda Theatre, the Lobero Theatre, and The New Vic are gracious hosts for the After Hours events. The events feature live entertainment, nibbles, & wine tastings. In honor of their upcoming New Year’s Eve POPS Concert, the symphony busted out their musical instruments and let us try them out! What fun! How do I play this thing? After giving the instruments a whirl, I headed upstairs to the Granada’s Big Screen to catch the sneak peak of the Lightwire Theater. They will be performing at the Granada on December 10th. I wish I was going to be in town to catch the show, because it looked fantastic! Next was the wine tasting, champagne, and music by guitarist Bryan Titus… All were very good! And, where there is good music you have dancers! Which US States Have You Been To? How Many US States Have You Visited? I came across this fun little interactive map on my Facebook feed. I was surprised to see how many states I’ve actually been to. I’ll have to work on visiting the rest! 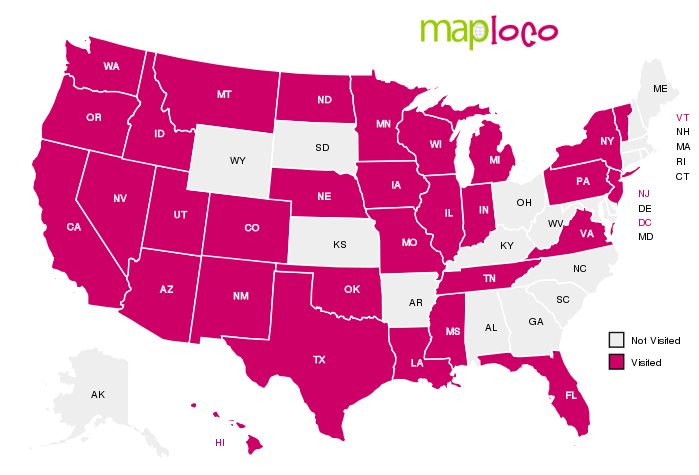 Create Your Own Visited States Map! I recently returned from a camping trip in Sedona, AZ. It’s one of my favorite places, and it had been far too long since my last visit. After looking forward to this trip for several weeks, a wildfire broke out in Oak Creek Canyon on May 20, 2014. Our campground was shut down, the road into the canyon was closed, and people were evacuated. After much contemplation, my friend and I decided to go anyway. We were able to find another campground that hadn’t been affected by the fire, and another route into Sedona, AZ. It was a vacation of contrasts, to say the least… It was one of the most peaceful I’ve had in a long time, and one that ended with a traumatic injury. I slipped while hiking, tried to save my camera, and ended up plowing face first into a small boulder. Thankfully nothing was broken, however, I did end up with a concussion. It’s been three weeks since the fall, and a very slow recovery. In the end, the fire was finally contained on June 4, 2014… 21,227 acres had burned. We arrived at Lo Lo Mai Springs Campground and were happy to find a tent site right along Oak Creek. After we set up camp, we headed into Sedona, AZ. This quickly put things into perspective. Signs of gratitude were everywhere. The next morning we woke up to the smell of a campfire… Not a good sign since they had been banned countywide! The wind had shifted, and smoke from the wildfire was hanging low over our campground. Air quality was poor, so we went back into town to find some sort of air masks. We ended up with bandanas and goggles! The smoke was so bad, we decided to go kayaking on the Verde River. We met up with the Sedona Adventure Tours team for a three hour guided tour. These guys are awesome, and the tour was tons of fun! Thankfully the smoke shifted and we were able to go hiking. We chose the Bell Rock Path. The higher you climb up on Bell Rock, the more twisted the juniper trees become from the vortex energy. The views in Sedona are phenomenal. After a four hour hike at Bell Rock, we headed over to the Airport Mesa Vortex. We wanted to grab a couple more photos, and it was a quick hike to the top. I was just about at the bottom, when I started sliding on some loose dirt. I landed face first into a small boulder, and had to take a trip to the ER in Sedona. When my friends suggested a day trip to Venice Beach, I couldn’t resist. It had been several years since I had last been there, so I packed up the Lensbaby and headed out. Venice Beach is a visual paradise, with no shortage of characters. We started our day on the boardwalk. With so many shops, restaurants, and things to check out, you can wander for hours. And, it’s definitely a great place to people watch! Next it was time to hit the beach, and bust out the surfboards. The waves weren’t huge, but they were big enough for the kids. We finished our day with a Margherita Pizza and Beer at Danny’s on Windward Avenue. Yum! What a perfect way to end a super fun day! It’s that magical time of year at the Coronado Butterfly Preserve in Goleta, California. It is just a short drive from Santa Barbara, and is a great day trip. The Monarch butterfly migration has begun, and it is spectacular! Thousands of butterflies hang in clumps among the leaves of eucalyptus trees. Others flutter about everywhere. It’s one of the most amazing things to witness in nature. There are approximately 30,000 Monarch butterflies gathered in the grove, with more arriving daily. It seemed like a good reason to go for a hike, and a good excuse to play with my new Lensbaby.